Easybet casino is a great new online gambling site for players looking for more. They start this off with a great welcome package that will get you up to $700. The Easybet bonus is a welcome package and when you make your first deposit you will be treated to a 100% match bonus up to $250. That's not all, make your second deposit and you'll get another bonus, this time 150% up to $450. It's actually quite a lucrative offer and the wagering requirements are standard at just 40x. There doesn't seem to be any game restrictions either. In addition to the welcome package, Easybet casino offers a range of recurring promotions for all players that include free spins, no deposit offers, weekly and monthly deposit bonuses, and more. Every weekend players can get a 20% bonus on deposits. Those who like to play during the week can take advantage of the midweek promo that gives them 30% on up to three deposits every Wednesday. The promotion match promo is the one to watch for and this happens every Thursday. The casino will match any other casino's offer that day so you could find yourself with some free spins, no deposit deals, and more. What's great about the offers at Easybet casino is that there are no coupon or voucher codes required to claim them and they are all instant. When compared with other casinos such as OrientXpress which offers a 250% bonus up to $500, Easybet is a good choice, but it should be noted that they don't have a loyalty program which some players might miss. Casino Easybet is available in a number of different languages including English, French, Italian, Spanish, Portuguese, and Swedish. It will be popular with European countries, but players from Canada are more than welcome and there are plenty of banking options for them to choose from. Players from Albania, Belarus, Bosnia and Herzegovina, Brazil, Bulgaria, Croatia, Czech Republic, Estonia, Georgia, Indonesia, Kazakhstan, Latvia, Lithuania, Macedonia, Mongolia, Montenegro, Poland, Romania, Russia, Serbia, Slovakia, Slovenia, Tajikistan, Thailand, Turkmenistan, United Kingdom, Ukraine or Uzbekistan are excluded. The games selection at Easybet online casino is excellent and there are over 800 to choose from. These come from top software providers such as Microgaming, NetEnt, HollywoodTV, Evolution, Ezugi, Play'n Go, GameArt, Pragmatic Play, Quickspin, Betsoft, iSoftbet, Reeltime Gaming, and Kiron. The software is available in no download instant play and the games can be enjoyed on mobile and desktop with many available to play in free demo mode too once you sign up for an account. Once on the casino website, you will see a number of game categories to choose from. These are All Games, New Games, Slots, Table, Jackpots, Favorites. The list of popular games can be found in the bar going across the bottom of the screen. Popular games include Fairytale Legends, Secrets of Atlantis, Twin Spin, Immortal Romance, Hot as Hades, Theme Park, Hook's Heroes, Good Girl Bad Girl, Pinocchio, Neon Stax and Explosive Reels. There are over 600 slots to choose from. The table games category gives players a choice of over 140 games including numerous variations on roulette, blackjack, and baccarat. There's also Casino Hold'em, Red dog, and a number of poker titles too. The casino also has a live dealer section with 72 tables to choose from. These live casino games run on Evolution software and include a variety of baccarat, roulette, blackjack, and poker tables. There are 34 progressive jackpot titles available and you can try these out for free using the demo version to see exactly how to hit the big cash prizes. Titles include Mr. Vegas, The Glam Life, The Slotfather, At the Copa, Greedy Goblins, Good Girl Bad Girl, Lucky Leprechauns, and more. It's a shame that none of the Microgaming or NetEnt progressive jackpots are included in the lineup as these have the biggest jackpots in the online gambling industry. The progressives included on casino Easybet are from Betsoft and the biggest payout to date has been on the Good Girl Bad Girl slot. $153,803 was paid out in June 2016 at Bovada and there haven't really been any big wins since. 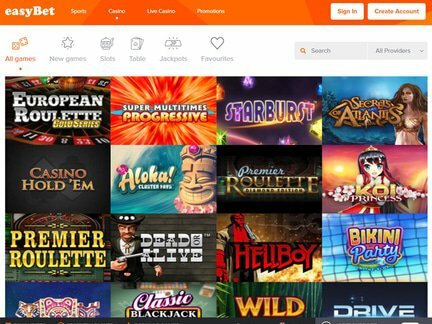 Easybet does feature a section on their website for the biggest jackpots available as well as the top winners for the site. 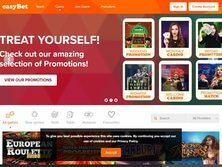 We weren't able to find any complaints about this online gambling site and so far they seem to have a good reputation. Because of this, we have given the site a five out of five rating, but we will be monitoring the situation and this will be adjusted accordingly should anything arise. Easybet is a new casino that is owned and operated by TGI Entertainment NV. It operates under a gaming license from Curacao eGaming and is licensed and regulated by the government of Curacao. The site uses the latest firewall encryption and technology to ensure that all player information is kept safe and secure and all financial transactions are encrypted. There is no mention of fair gaming on their website but as they provide games from Microgaming and NetEnt, we can only assume that fair gaming is guaranteed. Both Microgaming and NetEnt are eCOGRA approved. Easybet casino is well designed and very easy to navigate no matter what operating system you are using. The casino homepage clearly displays the $700 welcome bonus and a big button to create an account. Beneath this, players will find the different game categories followed by a selection of the most popular games. These change every time you visit the site. It's crisp and clean and looks great on mobile devices too. At the bottom of the screen are links to the FAQ's section, live chat, payment methods, and more. The Easybet bonus for new casino players is spread out over your first two deposits and is very easy to claim. There are no coupon or voucher codes required and the bonus money is added to your account immediately after you make your deposit. The minimum deposit for e-wallets is $10. There are lots of banking methods to choose from and Canadian player will be delighted to see Instadebit listed among them. Withdrawals to e-wallets are instant too once approved while credit and debit cards can take up to five days. All the games ran smoothly in my browser and I tested them on iPhone, iPad, and Android. I also played on my desktop. I had some wins on the slots and found the withdrawal process very quick and easy. You will have to submit documentation to verify your identity but all the information you need is provided. Customer support was excellent even if the live chat feature is only available from 9am to 9pm GMT. I found them very helpful and friendly. There's also a frequently asked questions section and you can email support 24/7 too. All in all, I found Easybet casino a joy to play at and they are in the process of adding a sportsbook too. For players from Canada, there is a huge selection of games, excellent payment options, and great promos to enjoy all month long. If you are looking for a new site to play at, why not give Easybet a go.